These homemade Polish doughnuts were made from the recipe that my mother used for probably close to 50 years of church bake sales. When I was still at home as a girl and a teenager, I used to help out with the Easter Bake Sale, where mom and the other ladies from the parish would bake tens of dozens of these beauties. (Think multiple 50 pound bags of flour and 4+ large folding tables full of finished homemade doughnuts.) People would come from all over the surrounding area just to get “those good doughnuts”. I hadn’t made doughnuts in years, since I moved to the other side of the state, but luckily my sister still had mom (grandma’s) recipe. Scald the milk. To scald milk: Place milk in a heavy-bottomed pan on low heat. Stir occasionally until milk is just hot with steam and small bubbles appear around the edges; do not boil. Remove from the heat. Add butter to warm milk and stir until melted. Allow butter and milk to cool until it is just warm (around 110-115°F). Add yeast and 2 cups flour. Mix well. Allow to rest for around 10 minutes to give the yeast time to “proof” or activate. The mix should be starting to bubble. Pour flour/milk mix into mixing bowl. Add egg, yolks, sugar, salt and vanilla. Mix well. Start adding the rest of the flour, one cup at a time, mixing after each addition, until you have slightly sticky dough. Dump dough onto lightly floured countertop to knead in the last of the flour. Depending on the humidity levels, you may not need all the flour called for in the recipe. You want the dough to be soft and elastic, not too stiff. Don’t overwork it or you’ll develop the gluten too much and your doughnuts will be tougher. Grease your bowl and gently coat your dough with oil. Cover and set in a warm place and let rise until double. While dough is rising, prep your frying oil. A deep fryer is great if you have one. I use an eight quart heavy bottom pot. I put in enough local, non-hydrogenated lard to fill the pot around 3-4 inches deep. When the dough has doubled in size, roll out to about 1/3 inch thick and cut out doughnuts. We used a large glass for the doughnut and an empty decorator sprinkle container for the holes. Let rise until double in size. 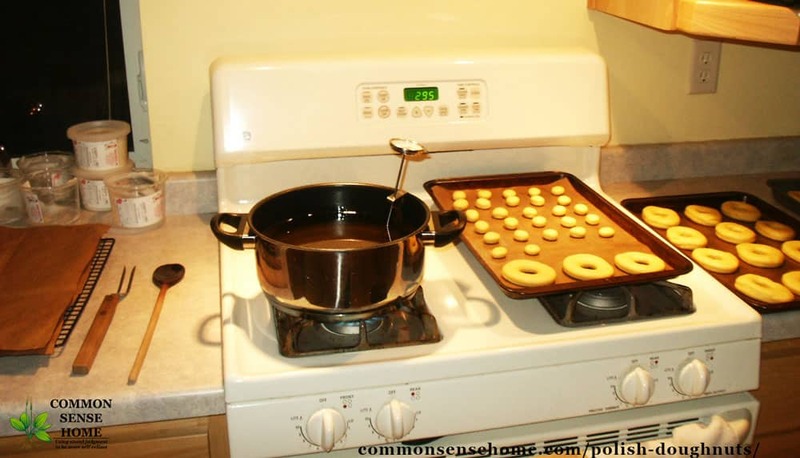 The frying setup – uncooked doughnuts to the right, finished doughnuts to the left. Heat lard to 340-365°F for frying (use a clip on thermometer to watch the temp if you don't have a deep fryer). Drop 3-4 doughnuts into the frying oil, keeping an eye on your frying temp. Cook until brown on one side, flip and brown on the other side. At this point, you can see the browning around the edges of the doughnuts. They are ready to flip and finish cooking. Once both sides of your homemade doughnut are golden brown, they're done cooking and ready to move to the cooking rack. 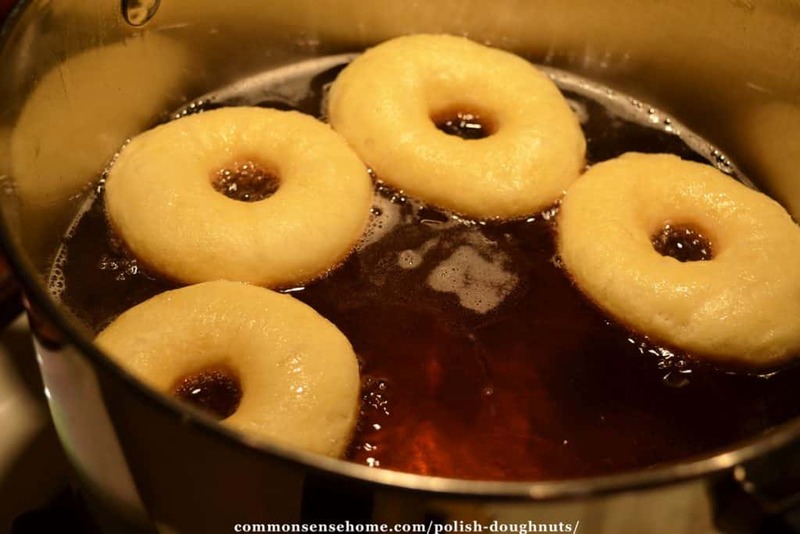 Remove doughnuts from frying oil and place to drain on a wire rack sitting oven a paper grocery bag. Dip in glaze or sugar while still warm, if desired. One batch of homemade doughnuts in the frying pot, finished doughnuts on a cooling rack with brown paper underneath. As you may have guessed from the smile on Duncan's face, grandma's Polish doughnuts didn't last very long, but everyone had a nice treat. I know it'll be sooner than 20 years before I tackle doughnuts again. 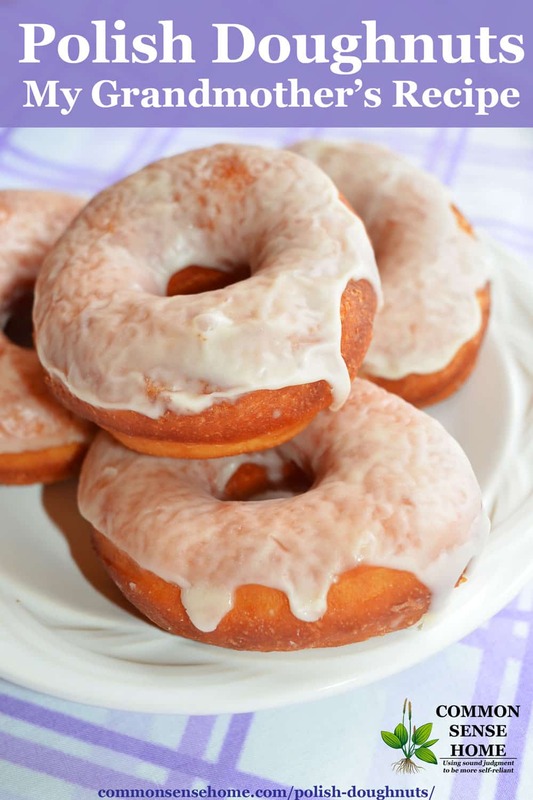 Delicious homemade Polish doughnuts featuring the recipe my mom used for over 50 years of church bake sales that was known throughout the countryside. Add butter to warm milk and stir until melted. Allow butter and milk to cool until it is just warm (around 110-115°F). Add yeast and 2 cups flour. Mix well. Heat lard to 340-365°F for frying. 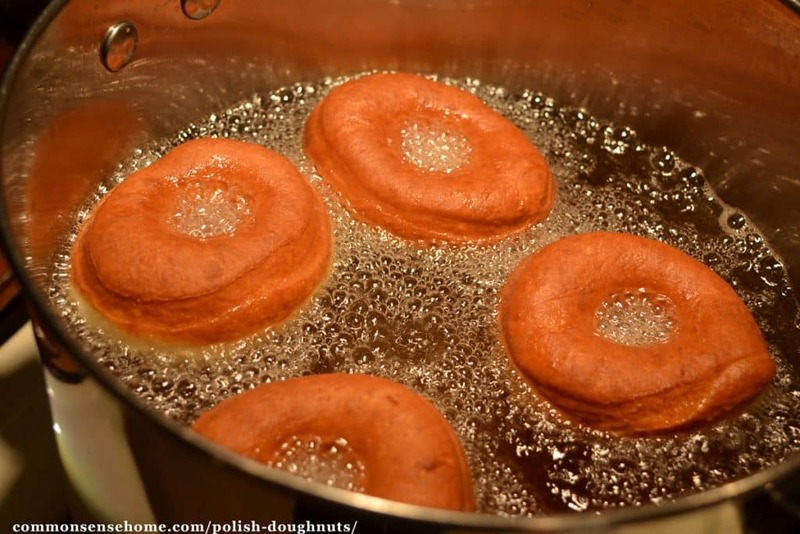 Drop 3-4 doughnuts into the frying oil, keeping an eye on your frying temp. Cook until brown on one side, flip and brown on the other side. For glaze, simply mix all ingredients together. This recipe and many other family recipes are featured in my book, “Never Buy Bread Again – 20+ Homemade Bread Recipes“, now available in Print and E-book formats here. P.S. If you're looking for a healthier doughnut recipe, see Jenny's recipe for Sprouted Grain Doughnuts . Originally published in 2010, updated 2016, 2018. I just read your previous posting. I am so sorry for the grieve your going through now. 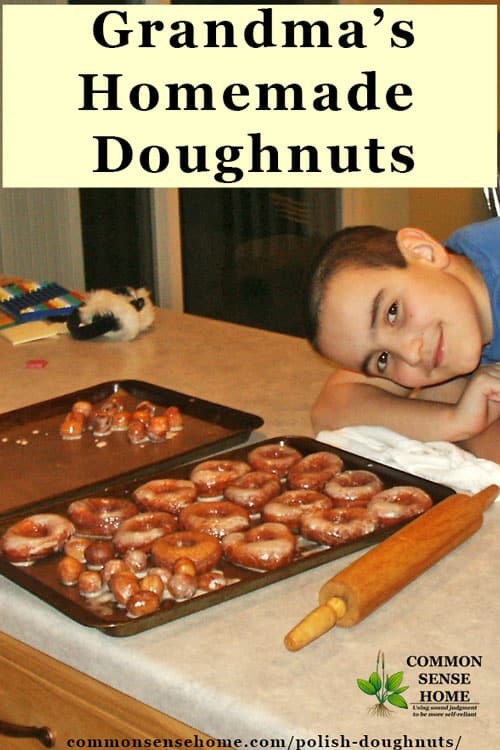 What a lovely way and fun way to remember your mama making these doughnuts. They may not be highly nutritious but it can be such a joy to toss aside the nutritional for the pure memory of it all. Hoping this comment goes through, been having issues with my computer / wordpress and other stuff…frustrating to no end. Hi Pamela. Thanks for stopping by and thanks for your kind words. 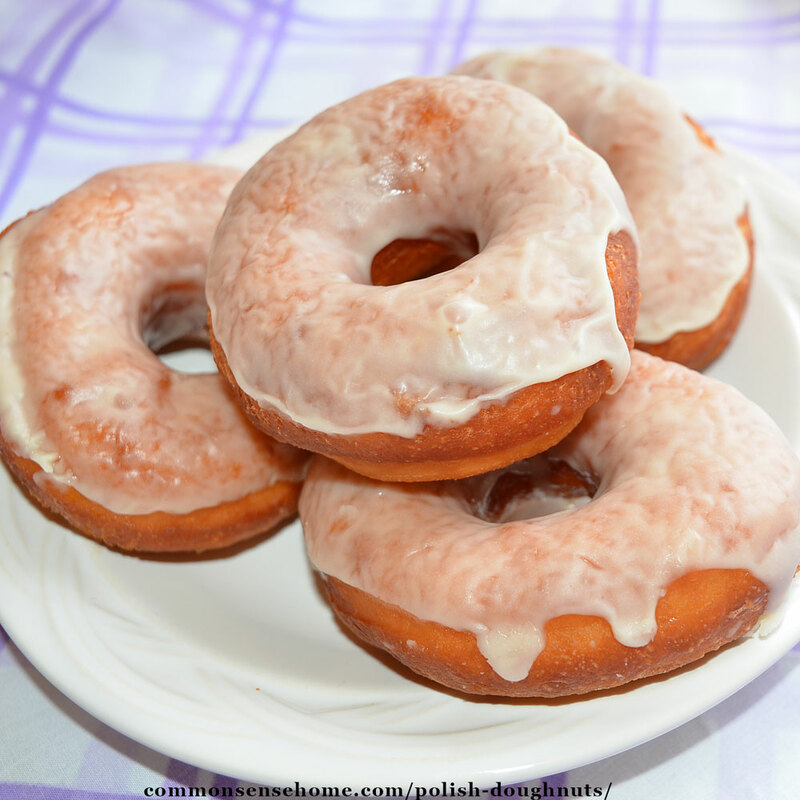 I had a great time talking with my sister about these doughnuts as I was prepping the post. She says she has some pictures from the last sale she did with mom, including one action shot of some fellow running into get his doughnuts – too funny! People really did go crazy over these. I hope to add those photos at a later date (sis, like mom, lives on the opposite side of the state, and her scanner isn't working). A new doughnut shop opened this past Saturday in my little town. I've been waiting w/much anticipation for this place to open since I learned of it in October. I was disappointed with the results and I also spied huge vats of canned "jelly" for the jelly doughnuts. Yes, I know, they can't make jelly from scratch for everything, but sheesh, at least hide it! My dh tells me I've become a "food snob". I was bit miffed. Anyway, these looks like so much fun to make. In fact, the boys and I just may make these on Lundi Gras (Monday before Ash Wednesday) as they'll be out of school and I'll be looking for something to keep them occupied! Thanks for the recipe. I figure I can pay higher food bills now or higher medical bills later, and I choose the first option. This recipe looks good. Do you think it will turn out alright if you bake them instead of frying? Oh . . . I can remember smelling the pazcki waft down the street towards our apartment in Warsaw. HEAVENLY! Stumbled upon you via Zinada's blog request. So sorry to hear about your mom. Will certainly be praying for the hearts of those mourning. Q – it is a lovely smell. 🙂 As for mom, I'm missing her very much, especially now as I am getting ready to place my order for garden seeds. We always gardened together, swapping seeds and stories even when we couldn't physically be together. I know it will get easier with time, and she is at peace now. They look delicious! It's wonderful with hand me down recipes that have been used for holidays. My grandmother gave me her cookbook with her favorite recipes. It is great because it shows how it was done from scratch. I made bagels a few times and that's one of those things I didn't do very often. They were delicious but they took time to make. Yes, labor intensive but very tasty. Definitely a treat item. I haven't tried to make bagels yet, but it's on my "bucket list". Laurie, this is wonderful. I love hand me down recipes. It must be special. Thanks for taking the time to visit, Jasmine. Yes, there are memories in every bite. I'm "passing through" from the Domestically Divine link-up. Your steps for doughnut making were quite thorough. My husband has been wanting me to make doughnuts for awhile now. I'm still bit of a novice when it comes to cooking foods with yeast. This looks do-able, but I am a bit leery about not taking the temperature of the liquids before I add the yeast. Humm . . .
Lady Rose – I just added temps to the post. Aim for around 110-115 F for standard dry yeast. Hiya, how much is in a packet of yeast (say if I had in in bulk) is it about a tablespoon? Thanks for sharing this recipe. I might give it a go I think! Bernadette – measurements are in the recipe where the yeast is added (I guess I should bump them up to the ingredient list :-). "one package (2 1/4 teaspoons) active dry yeast. I used SAF-INSTANT yeast, so I added about 1 heaping teaspoon"
Oh wow, I bet these are incredible! The are a labor of love, but definitely the best doughnuts I have ever tasted. Grandma’s recipe said to fry at 340-265 F, as mentioned in the post. I fry on one side until brown, then flip. You’ll get a feeling for how long you need based on the temperature you have. 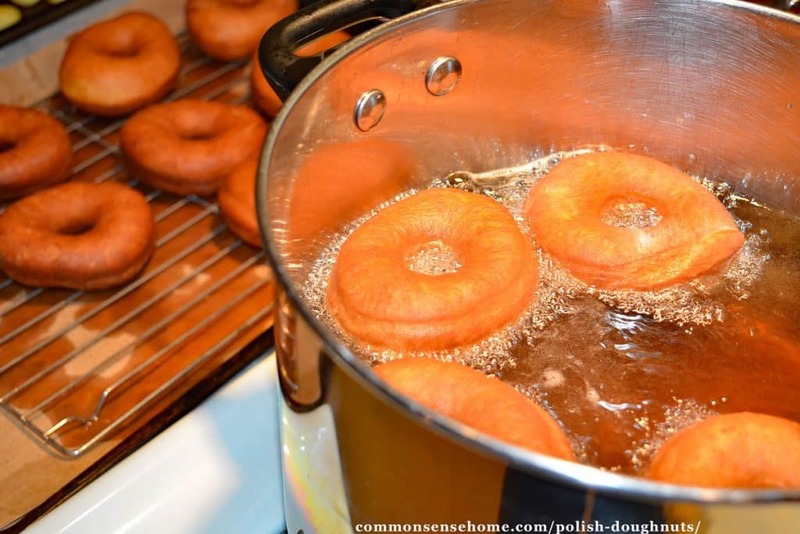 The only issue with making a batch of donuts…..(have always wondered WHY they call it a batch?Told ya I digress!..lolol)….is that we would hafta eat the “whole batch”! is this like armour pure lard from the store? I think Armour may hydrogenate some of their lard now to extend shelf life, so I usually pick up my lard from a local butcher, but yes, just plain lard is what you’re looking for.